Gallery furniture art made with most unusual classic car parts. 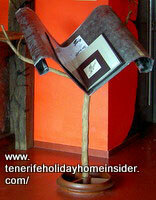 The art gallery furniture of Manufactum Puerto de la Cruz has an owner who is absolutely out of the ordinary. He is one of best Spanish artists in many fields. Therefor, the gallery furniture which he made is just es fantastic and rare. That also rubs off on his Tattoo business which is in more than in a studio. It's in a rather large show room for exotic tattoos as well as for selected fine art. 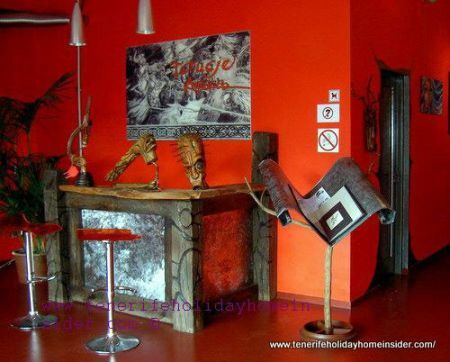 On occasion, this Tenerife international art gallery has top displays of all kinds of handmade artistic objects, most of which are ideal for the art gallery. Recycle art executive desk made with classic car parts. Admire the recycled executive desk of the Manufactum show room furniture - sorry not for sale - when you enter its premises. By the way, touching it, is a sensual delight. Nope, no old vehicle seats disappoint your expectation in this case. The main object used, as part of the desk, was a sturdy luxury car bonnet. Its copper metal has been hand polished to give it a second life of absolute glamour. A metal suspension of the bonnet doesn't attach it to a vehicle part, but to a dark hardwood tree branch. Everything would almost float, if it wasn't for an exquisite wooden support underneath this elegant gallery furniture. 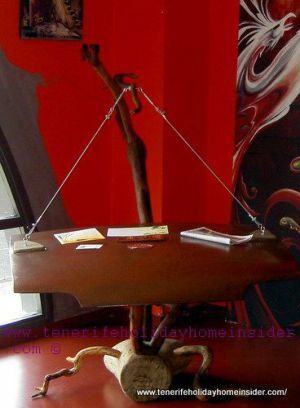 This timber stand has legs which are are as asymmetrical and natural like the timber post which seems to carry this indisputable furniture art. The legs look very uneven, as if they were belonging to some drunken, multi-legged insect which is trying to get up unevenly. This amazing fantasy art fits in with the rest of the high standard of this classy gallery which has a touch of a surrealistic art museum. Salvador Dali would applaude in his tomb if he saw such hilarious imagination put into practice. Gallery furniture sideboard a reception desk. Now more about the furniture which was presented at the start. 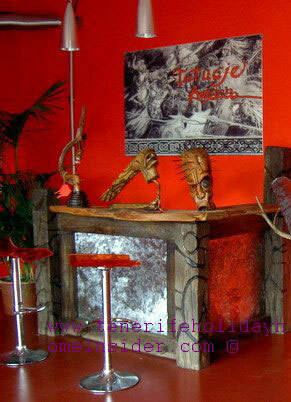 This triangular reception desk with its carved wooden frame stands on the opposite wall. Not even its background design has surreal appeal. You may think that it is a sideboard on first impression, as two wooden sculptures made by Giuliano Montisci grace its top. I leave the rest to your fantasy to judge how it was made. Montisci innovative art show rooms. Beside stands a display magazine or art stand for the browsing of unframed drawings or prints. But, this one doesn't grace other galleries. It is very unusual, indeed. It seems to be much stronger than what art stands are normally and looks like made of bent stainless steel. The design distracts from the polished surface. It becomes understated elegance. The two arms of a white tree branch whose bark was removed hold everything up. All has been attached to a foot which resembles the saucer of a pot plant. The result of it is another beautiful, rather very artistic gadget. In short, designer furniture for a gallery of the best. The next photo of furniture of a gallery is a bit unfortunate. Why? Well, you may think that you see a harp on first sight. So what about this book-stand? Two short wooden shelves were attached to curbed drift wood, as it appears. Here, the woodwork of the rare book stand looks lovingly finished off. All is held up by a strong, round metal foot. Perhaps, the dark timber was previously stained or varnished, which I don't recollect. Other art stands complement the gallery furniture. Find them, while you walk around the big art display rooms. Some look like they are having broad, expertly sculptured bases. Most of those are of light timber which has the color of pine. Detect sculptures of the same tree under two modern office desks. Perhaps they were only placed in a make believe supporting fashion. Tenerife exhibitions by Manufactum and many links to other art shows on the island. Please, pay it forward and pay back by clicking the Plus1 below. Thank you.